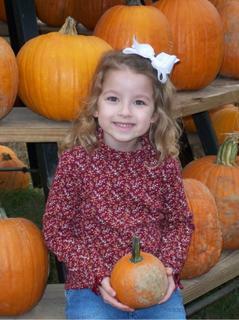 I have to say Gentry's is one of the best pumpkin patches I've been to and I've been to several! They had everything neatly arranged and lots of activity centers for the kids to play in. The only downside was that we only had an hour and a half and it just wasn't enough time. We did do a hayride but we didn't have time to go thru the huge corn maze. Maybe next time. I absolutely loved all their displays and I got some great shots. Caroline had a few minor melt-downs and cried which is really not like her. She usually is on Cloud 9 at something like a pumpkin patch. She hadn't eaten much all day and I think she was just cranky. She perked up after dinner and was fine. 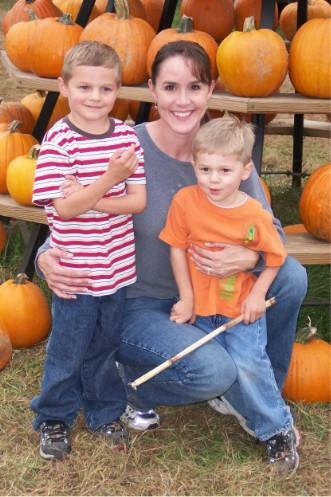 Here's a cute pic of Michelle and her kids. Dalton absolutely cracked me up because as soon as we got there, he got a stick and held it the whole time. Michelle said he does that everywhere! After dinner, we had a slumber party at Courtney and Jennifer's house! It was fun! We stayed up late and watched Pooh's Heffalump Halloween movie. It was cute. I'm glad to be back home today but I'm tired, tired, tired. a pumpkin patch AND a slumber party! i guess i think my own kids are enough to get to bed!! Those pictures are great! I'm going to drop off my film tomorrow and pray mine are half as good. I hate to say it but Caroline looks so grown up! What is our next field trip!? What a cutie! Caroline is growing up so fast. Sounds like a great time! Ohhhh gasp! I picture of me! LOL It was a lot of fun. We have gone to Gentry Farm every year and I just love it. Glad we could all go together.